So I got a hot tub--a spa they call it. It started earlier this year with some silly tweets about me wanting a hot tub. I pledged I could be a better writer if I had a place to sit and think. Also, I just really wanted a hot tub and I won't be able to afford that kind of luxury for a LONG time. Maybe ever. Some of my friends on twitter started to get in on the conversation with clever responses and before I knew it there was a hashtag and an inside joke. 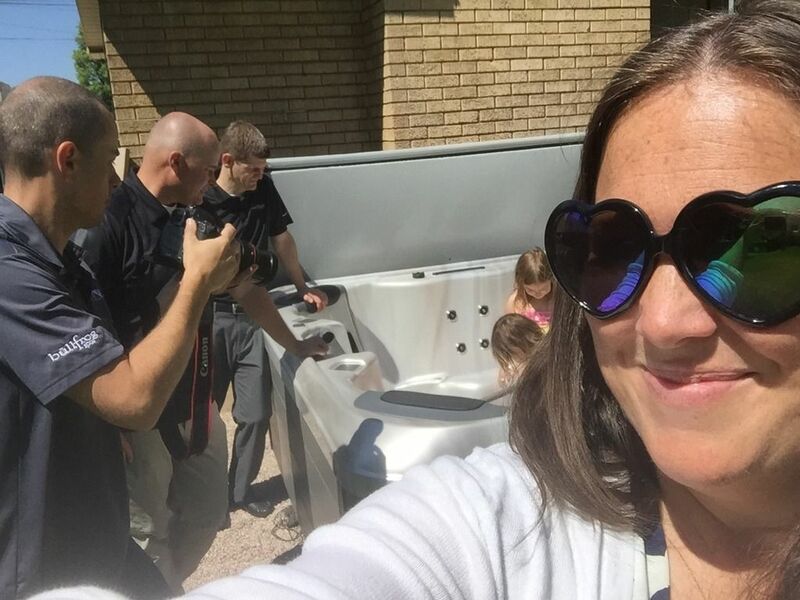 But then one morning I woke up to find that my friend Scott had actually tweeted @bullfrogspas and said "You should give C Jane a hot tub" AND THEY HAD RESPONDED. 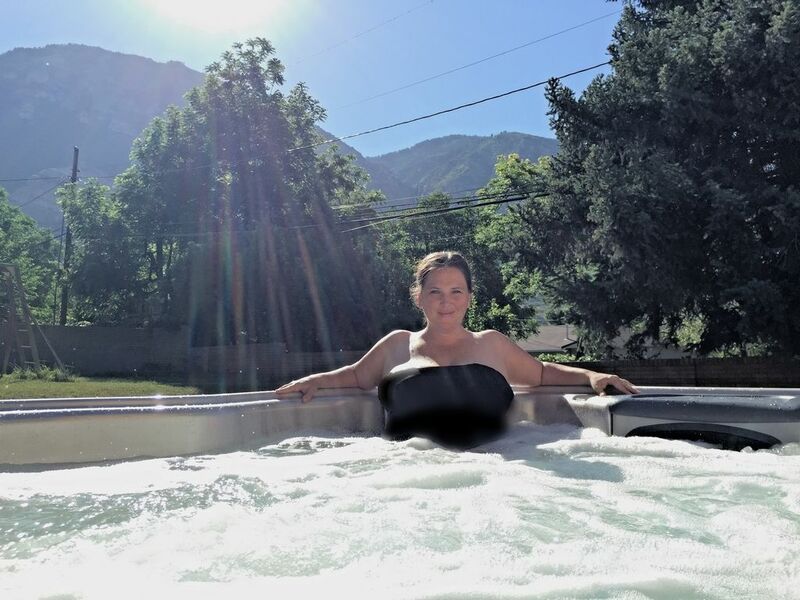 Bullfrog Spas is a local company here in Utah that ships luxury, energy-efficient hot tubs all over the world. I have loved their company for many many MANY years. Suddenly my dream of having a hot tub was in reach! I couldn't believe it. I ran throughout my house squealing. Like a pig. Like a pig who was maybe going to get a hot tub. I promised I would write once a month for a year in a series I will call (are you ready?) SPA HA MOMENT (get it?). The series purpose is to use this amazing gift as a means to becoming more relaxed and thoughtful in a lifestyle that is overwhelming and mind-melting (literally, I think I can prove it). I feel a little embarrassed at my luck here. I keep saying to myself, For ten years I cultivated a blog and wrote my guts out! It's ok to have a hot tub to self-congratulate! And I pledge to be a responsible spa writer and write about the issues that are meaningful and relevant! But I wasn't exactly convinced of my worthiness until the morning after it was delivered and we filled it up and let it heat over night. I woke up early, slipped out of my bedroom door outside and jumped in to my spa to watch the sun crawl over the mountain in my backyard. I've never felt more luxurious in my life. And I thought, I am just going to live this up. But in total disclosure the hot tub has taken on a life of its own in our family. It's like we got a dog. It gets petted and groomed and fed. 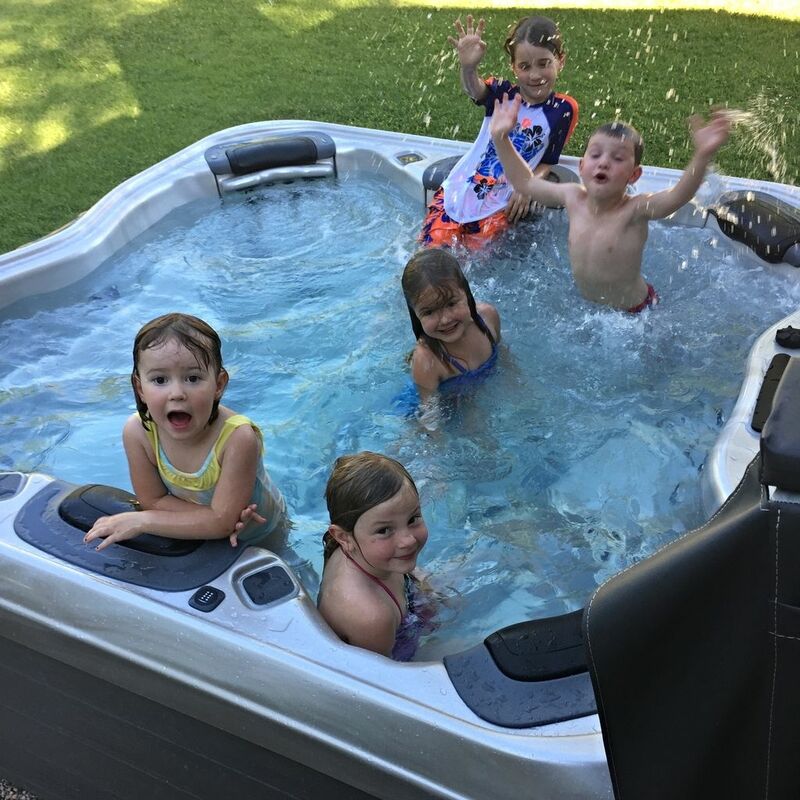 The kids do all their morning jobs just for the reward of getting in and splashing around (we keep it on the cool side for summer). Right after we got it Chup did something wretched to his back and now every night he soaks for an hour or so putting the jet technology to good use. I made him get a water case for his iPhone so I could check on him from my bedroom on the other side of the wall. He cares for it like an aquatic lover and I suppose there has been some jealousy on my behalf (okay?). Cousins, neighbors, friends all pile in for special social hours. We've never been so popular. I don't think I've been in it by myself for more than ten minutes. But that's ok. That's my life right now. You do what you can. Let's just hope I start writing some masterpieces here or I am in trouble. It won't be the first time I've oversold myself (to be honest). Thanks Jake and team from Bullfrog Spas. I love you. I seriously mean that.